Back on the Market & Won't Last...Seller Listened To All Previous Buyer Feedback! Seller Installed all new Flooring, New Stove/Oven w/ Butcher Block Counter, New Interior Paint, New Light Fixtures, New Window Treatments and Professionally Cleaned Throughout! Dont Miss the Opportunity To Own a Beautiful 2-Bedroom & 2-Bath Ground Level Unit w/ Greenbelt Views under $200K. 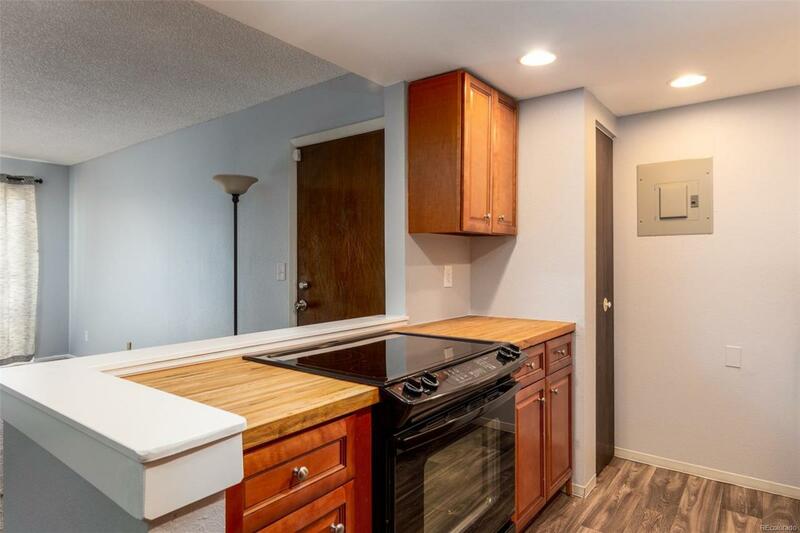 This Unit Has A Remodeled Kitchen with Raised Panel Maple Cabinets and Granite/Butcher Block Countertops. Relax in the Spacious Living Room with a Hearth Wood Burning Fireplace on Cold Winter Night. Retire for the Evening in the Large Master Bedroom with Remodeled Master Bath. Internet & Cable Wired. Close Proximity to the Swimming Pool, Tennis Courts, and Basketball Court. One of the Few Units with a Detached Garage and Reserved Parking Space. Excellent Location Close to Restaurants, Shopping, Schools, I-225 and the Iliff Light Rail Station.